Sorry, Bart. It looks like Butterfinger's first Super Bowl ad will have a theme better suited to those over 18. The Super Bowl spot, by ad agency Dailey and director Clay Weiner of Biscuit Filmworks, will launch Butterfinger Peanut Butter Cups. 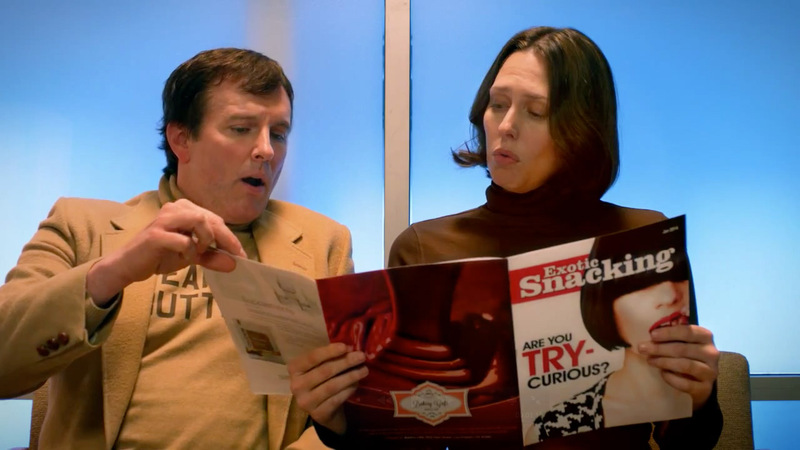 The Nestlé brand released a teaser on Tuesday showing peanut butter and chocolate going to couple's therapy in an effort to spice up their boring relationship (a not-so-subtle jab at peanut-butter cup market leader Reese's). The whole teaser is pretty suggestive, particularly when another couple, cheese and crackers, emerge from the therapist's office excitedly fondling a giant hard salami. Peanut butter and chocolate, meanwhile, begin to see the possibilities of a more satisfying union themselves by staring at the centerfold of a copy of Exotic Snacking magazine. "The cup is about to get crunchy," says the tagline. The Super Bowl ad will be a different execution but with the same couple's therapy theme, the AP reports. For more, see the campaign site at www.butterfingercups.com. UPDATE: It appears Butterfinger has removed the original teaser and uploaded a replacement (see below) that is less racy. Asked why the original was taken down, a rep for Butterfinger told us: "We are telling a story about two classic combinations—peanut butter and chocolate—and want consumers to follow our story. This current teaser will pay off during our 4th quarter ad for Butterfinger Peanut Butter Cups during the big game."